Amazon has a sale on the Fisher-Price Rock, Roll 'n Ride Trike for $19.99. This is a 3 stage trike where during stage one it's a rocker, stage two it is a push-able trike, and in stage 3 can be a regular trike bike. 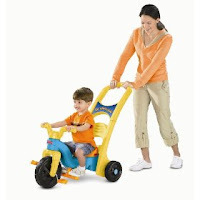 This particular trike usually sells for around $39.99 and is essentially about half off at this price point.